Neuro Linguistic Programming is a form of psychotherapy that focuses on specific interactions between the brain, language patterns, and learned behaviors. This type of therapy can help people understand how they communicate with themselves and others. In doing so, they can change poor communication habits over time. NLP can help those struggling with addiction to understand themselves on a deeper level. This can help them discover the reasons behind their issues. This deeper understanding can serve as a protection against future problems. NLP can help people develop better communication skills. As a result, they will often experience improved relationships with others. NLP may also help those suffering from addiction to develop positive coping skills. These skills can help them ward off future cravings and temptations. Many people facing addiction suffer from low self-esteem. NLP can help change the way they think and talk to themselves internally. As a result, they can experience a greater degree of confidence moving forward. What Additional Treatments are Effective? The benefits of NLP are extensive. However, this form of therapy is often combined with other interventions for best results. For example, other forms of counseling may also be offered. Additionally, behavioral modification can be used to help transform negative thoughts and behaviors into positive ones. Finally, prescription medication and recreational therapy can also be combined with NLP programs. The right rehabilitation program for you will be designed with your specific needs in mind. How Can I Find the Right Rehab Center? Since the benefits of NLP can be far-reaching, it only makes sense that you want to find the right rehab center for your needs. This process doesn't need to be confusing. Start by talking to your family about the issues you're currently facing. Discuss common goals you would all like to reach in the future. Work together to find the right dual diagnosis treatment center for you. 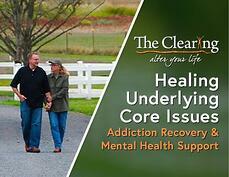 The Clearing is a respected residential addiction treatment center serving the needs of the San Juan Island, WA area. The experienced staff at The Clearing provide an array of holistic treatment options in a safe and peaceful setting. Even those with a complex dual diagnosis will be relieved to find the quality of care that will provide them with lasting benefits. Don't let an existing substance abuse problem stop you from reaching for your dreams. The right rehab center can give you access to the tools you need to overcome these issues. Call 425-275-8600 to learn more about how the innovative treatment options available at The Clearing can help you get started on the road to recovery.